Android smartphones have evolved a lot with loads of features and customizations. Still, many phones lag many features out of the box. Like other phones, OnePlus 6T doesn’t come with a notification LED. It has a better option of getting notifications using ambient display. But in case you missed to check out the notification while it popped, it’s gone and you have to pick up the device to check it. This can be a tedious job while you are busy working, or in a meeting and don’t want to miss out what’s happening. So today we will tell you how to loop ambient display notifications in OnePlus 6T. This will solve problems for many OnePlus 6T users and even others having ambient display feature. One thing to love about Android is, even if the phone manufacturer misses out features in the OS, there are apps available for rescue. This time also, we have an awesome app which solves this problem in OnePlus 6T. 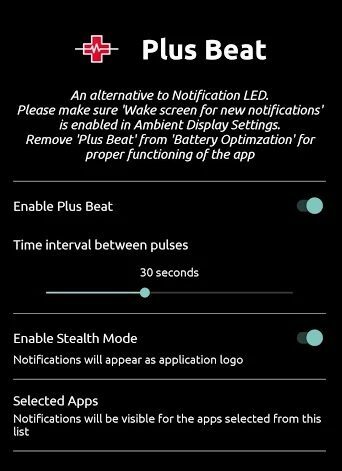 First, make sure that you have enabled the option “Wake screen for new notifications” by going to Settings->Display->Ambient Display. Next, download Pulse Beat app from the Google Play store. You will see all the instructions and options laid out in the app. For this app to work properly, you will have to remove it from battery optimization options. You can set a time interval for notifications, and they will keep on looping one by one until you check them. Also, you can set different colors for different app notifications, and enable stealth mode to hide the content. You can handpick the apps whose notifications you don’t want to miss. This will avoid unnecessary notifications from every app. This is how easily you can loop ambient display notifications in OnePlus 6T and stop missing the notification LED. Will this consume a lot of battery? Well, the ambient display is made up in such a way that only a few pixels light up to show the notifications. So this will not consume a lot of battery too! The beauty is, all these customizations come for free. This app solves the issue of not having a notification LED in OnePlus 6T and still not missing the notifications. Just be lazy and still catch all the notifications without even lifting your device. I hope the trick to loop ambient display notifications in OnePlus6T helped you all. Do try this feature on other devices with ambient display and let me know if it works for you through the comment section below. ← Do you really need an SUV?